Bernard continues to chip away at the mystery of his sister-in-law Tessa Kosinski's death in Berlin on the crucial night when his wife Fiona was brought out of the East. Fighting to uncover the truth, he must also confront the key relationships in his own life: Fiona is still far from stable now that she has returned to work, and their children remain in the clutches of his wealthy and manipulative father-in-law. Meanwhile, Werner Volkmann, Bernard's friend since childhood, is reluctant to get involved in Bernard's crusade. 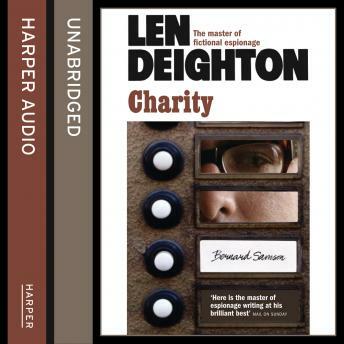 A wonderful depiction both of covert operations and office politics, Charity is packed with action, incident and intrigue, bringing to a triumphant conclusion a series of ten novels that represents one of the great acheivements of modern English fiction.